Are you considering training your cat to be a therapy cat? Looking for help/ advice/ support as a new team? While facilities vary on their requirements for pet visits, registered therapy cats must be able to walk on a harness/ leash. Desensitizing your cat to the harness and leash are important first steps in training. Several therapy cat teams also use pet strollers to transport their cats safely (be sure to check with your registering organization however, since rules vary on this point). 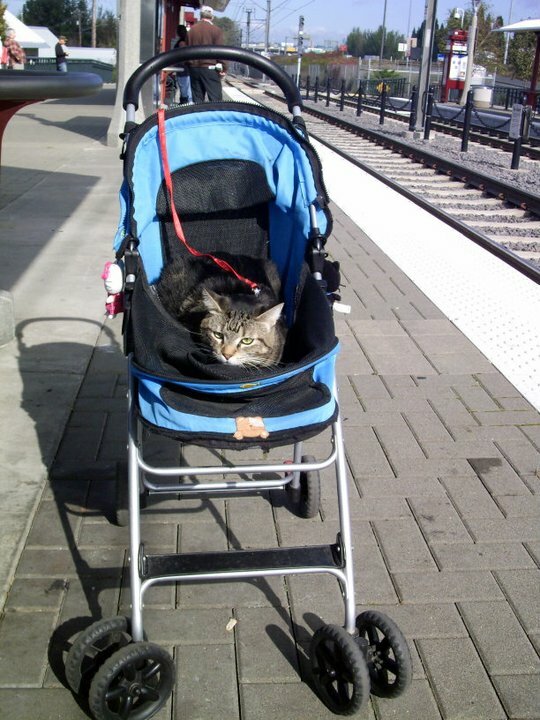 Get your cat used to a pet stroller by associating it with treats and positivity. Therapy cats also should be desensitized to visiting public places. Many pet stores and Home Depot stores will let pets in their stores, so visiting one and sitting in the furniture area is an excellent way to train your cat to be accustomed to wheels, beeping noises, and different people. If you are looking for local resources and contacts of therapy cat teams, click here!